The American College of Physicians (ACP) hosted its 2014 Internal Medicine annual meeting in Orlando, Florida this past April. Dr Geraldine E. Menard, an associate professor of the Department of Medicine at Tulane University School of Medicine, presented high-yield General Internal Medicine concepts as part of a review of the ABIM syllabus. Those key take-home teaching points have been adapted and summarized here, with Knowmedge visuals. As we continue with #GeneralInternalMedicine Week, we present five topics: Biostatistics, Smoking Cessation, Alcohol Screening, Strep Throat, and Sinusitis. A test that has high Specificity is used to “rule in” a condition when the result is positive; whereas a high Sensitivity is used to “rule out” a condition when the result is negative test. A favorite mnemonic your friends at Knowmedge use is “SPin” and “SNout”. 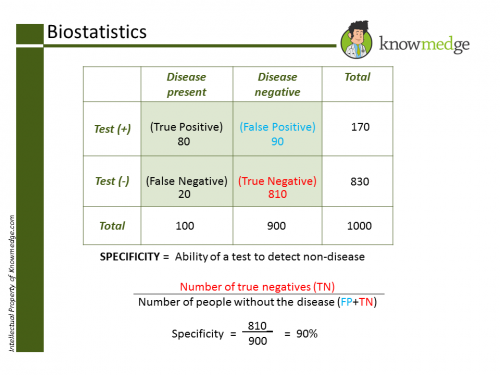 A test provides the most useful information when the condition has an intermediate disease prevalence (30-70%) or intermediate pre-test probability. Data can be skewed by being presented as an impressively large risk ratio. If the absolute risk reduction (ARR) is small, the intervention isn’t particularly effective. The number needed to treat (NNT) is simply the inverse of the absolute risk reduction (ARR) as in NNT = 1/ARR. 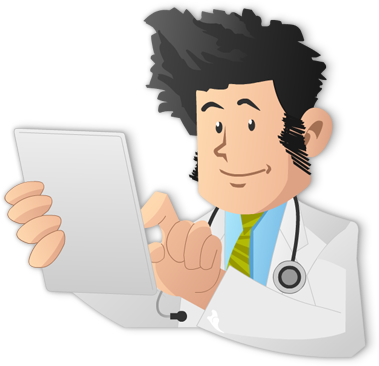 NNT represents the number of people who are required to undergo treatment before one person benefits. The similar-sounding number needed to harm (NNH) is the number of people who are required to undergo treatment before one person is harmed by the treatment. Relative risk confidence level should not contain the value 1. If it does, that means that the treatment may or may not be effective. 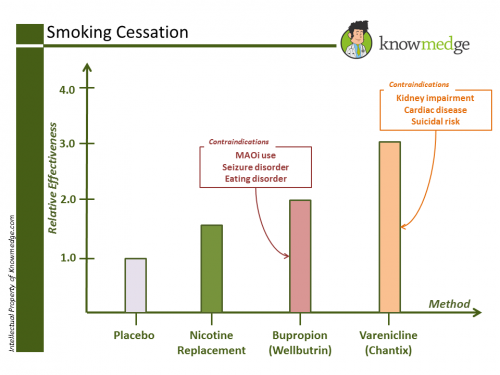 Varenicline has a 3.5 fold increase in achieving smoking cessation versus placebo alone and is nearly twice as effective as Bupropion. It should be avoided in patients who have suicidal ideation or at an increased risk of cardiovascular events. Bupropion is a reasonable smoking cessation option. It is twice as effective as placebo in achieving smoking cessation. However, it is contraindicated in patients with seizure disorder or who at risk of developing seizure disorder. Also, patients with eating disorder (anorexia or bulimia) should absolutely avoid it. SSRIs like sertraline and SNRIs like duloxetine are not indicated for smoking cessation. 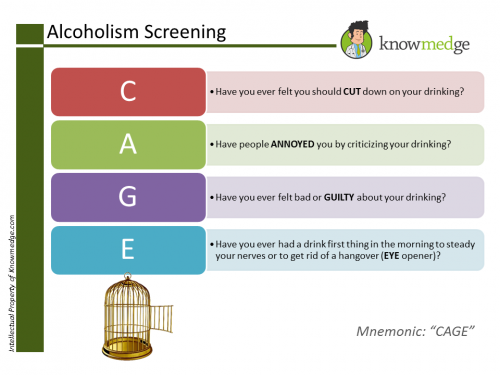 CAGE screening: A score of 2 or more is considered positive and warrants further counseling regarding the dangers of excessive alcohol use. 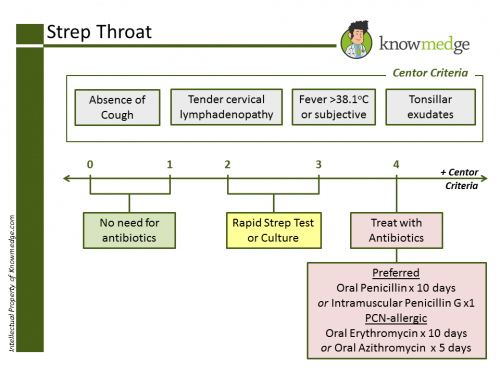 One of the most commonly encountered complaints in General Internal Medicine, sore throat should be evaluated using the Centor criteria when there is concern for Strep throat. Treatment: Preferred treatment is oral Penicillin for 10 days or single intramuscular shot. Only give the commonly prescribed azithromycin (or erythromycin) on the boards for strep throat if the patient is allergic to penicillin. Less is more in the treatment of sinus symptoms. 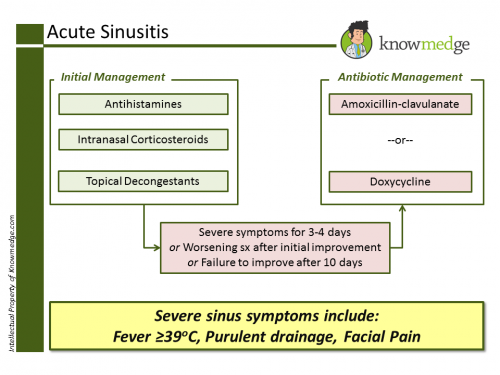 Look for the buzz words–purulent nasal discharge, unilateral maxillary pain, or worsening symptoms after initially getting better. If none of these are present, supportive care is the best way to manage. No antibiotics. No sinus scans. So, there you have it: 5 high-yield General Internal Medicine topics to master in your preparation of the ABIM board exam. Feel free to drop us a note below if you have any questions or additional pointers.